Parking Fee: $3.00 per vehicle collected at the entry gate. 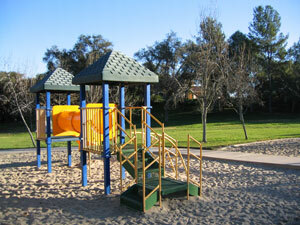 Although it's located within the City of Escondido, Felicita Park maintained and operated by San Diego County. Felicita Park is the site of one of the largest and oldest Indian villages in the county. To this day, grinding holes and other artifacts reveal evidence of the centuries-old community of the Northern Diegueno Indians. In 1867, an Irishman by the name of James McCoy acquired the Bernardo Rancho which included a portion of what is now Felicita Park. His large flocks of sheep ranged over this land called McCoy's Grove. In 1871, Mr. McCoy was elected to the State Senate and played a prominent role until his death in 1895. The property, later owned by Ransford Lewis, was purchased as a county park for the sum of $12,000 in December 1929. The park was given its name because of the Felicita pageant, based on the book, Indian Stories of the Southwest, which was performed in the park from 1928-1931.